The Need for Accurate Medical Translation - Niki's Int'l Ltd. Most people have gotten a good kick out of signs displaying incredibly poor translation. Beware of slippery, poisonous and evil rubbish, do not disturb tiny grass and the ever so creative, our food is guaranteed not to cause pregnancy are all poorly translated signs found around the world. These poor translations may not be giving you the proper information you need but they make for a great laugh. Although humorous in this situation, poor translation in the medical field can cause severe reproductions, damage and can literally put a patients life in jeopardy. Medical translation is a very technical, it takes an immense amount of education, experience and knowledge to successfully and accurately translate for the medical field. A mastery of advanced medical terminology, a strong grasp of procedures and practices and a thorough understanding of both languages spoken and their respective cultures are required in order to accurately translate medical content. Medical translation is widely known as one of the most difficult and strenuous forms of translation. It allows doctors the ability to read and understand new concepts, studies, and approaches and it allows advancements in modern medicine to be spread to medical professionals around the world. Medical translation extends understanding to patients who speak a different language, allowing them to read and comprehend information such as medical consent forms, intake and informational forms, documents explaining surgical procedures, medication instructions as well as pre-op/post-op guidelines. Medical translation needs to be precise, functional and it can not in any way deviate from the original meaning. California’s Riverside Parkview Community Hospital Medical Center removed the wrong kidney from Spanish speaking patient Francisco Torres in 2010. Torres, with the encouragement and direction of the hospital staff signed a consent form indicating which kidney was diseased and needed to be removed. Torres being a native Spanish speaker was never provided with a copy of the consent form in Spanish and was left to sign an English copy in which he had no idea indicated the hospital planned to remove the wrong kidney. After catching the mistake, the hospital removed Torres’s diseased kidney, leaving him with no kidneys. “The big question we have is how can that happen? Why isn’t somebody saying, ‘Gee, today it’s right, and for the past two weeks it’s been left,’” says Shirley Watkins, Torres’ attorney. Watkins also stated, “So he’s left without a kidney, and for many people on lifelong dialysis, there’s no question it’s going to have some effect on the quality of his life and life expectancy,” Watkins filed this lawsuit on Torres’ behalf and they are seeking damages in the seven figure range. In Germany in 2006-2007 an error in translation resulted in 47 failed knee replacement surgeries. The Journal of Specialised Translation stated, “Two different types of that knee prosthesis are available — for use with or without cement. The source language label on the package of the prosthesis included the information that the femoral component was “non-modular cemented,” which was incorrectly translated as “non-cemented” or “without cement.” Due to this very small but extremely important detail being translated incorrectly, 47 patients had to undergo the painful knee replacement operation twice in order to fix the mistake that happened during the first surgery. The Tran family endured a tragic case of dealing with not only a lack of translated medical information but a disregard for a much needed medical interpreter. A nine year old girl was asked to interpret for herself when she returned to the hospital after her initial visit. While interpreting, she collapsed as a reaction to one of her prescriptions. The 16 year old brother jumped in and attempted to interpret for his Vietnamese parents but by the time the doctors were up to speed, the girl was already dead. When the girl originally came to the hospital she was discharged after being dosed with the drug that would kill her, none of the discharge instructions were translated into Vietnamese. When treating patients with language barriers, it’s always best to incorporate the use of a professional medical translator, in order to ensure accuracy. There is no room for error when it comes to providing a person with medical information. It’s vital patients understand what is going on in order to make the correct decisions regarding their healthcare. Doctors and medical staff rely on medical manuals and instructions to successfully care for their patients. When medical content in poorly translated it leaves room for substantial errors to be made resulting in poor patient care, additional injury, malpractice or even death. 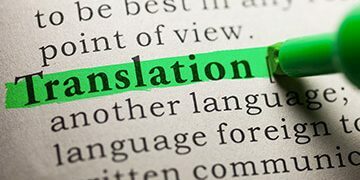 With the aid of a professional language service company (LSC), a highly trained and experienced medical translation specialist can be supplied. Don’t wait till it’s too late, contact Niki’s Int’l Ltd., a LSC who is dedicated to accuracy, quality and professionalism within the translation industry.